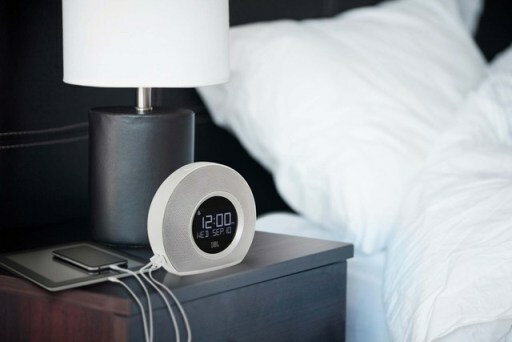 Sound specialist, manufacturer JBL decided to market a solution to wake up gently with stereo music and light. It embarks speakers, a simplified control system and LED. It has two alarms for two person or waking hours vary between weekdays and weekend of those people. For music, the JBL Horizon speaker features storage of 5 FM stations, Bluetooth connectivity to stream music from smartphone or a touch pad and the classic buzzer. Also note the presence of two USB ports that can recharge a mobile terminal. Compact measuring 160x183x86 mm, the chamber has a digital display and features a light sensor and adjusts the light diffused according to time and the room lighting. The clock radio speaker JBL Horizon is available for about €100. It comes in black or white color.